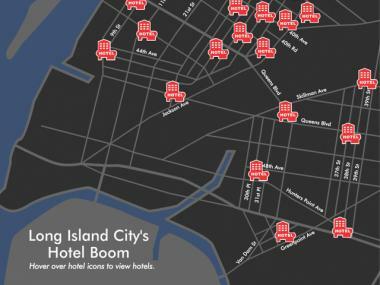 LONG ISLAND CITY — When it comes to cheap hotels in New York, Queens is king. A surge in construction over the past several years has brought both budget-friendly and upscale lodgings to Long Island City with several more on the way, enticing tourists and businessmen alike with their proximity to Manhattan, comparatively lower prices and stunning skyline views. Most of the 18 hotels drawn to the burgeoning neighborhood just across across the East River have been built within the last five years, bringing the total number of rooms to about 1,500, industry and tourism officials say. Aside from major companies that have claimed a foothold in the neighborhood, including Fairfield Inn and Sheraton, there are several boutique properties such as the Z NYC, the Verve Hotel and the Ravel Hotel, which features Mercedes shuttle service to the subway and a massive rooftop restaurant and lounge with Manhattan views. 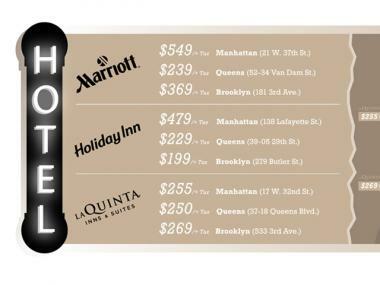 Primarily clustered around the Queens Plaza transportation hub, which includes access to several subway lines as well as the Queensboro Bridge, they offer prices as low as $120 a night, nearly half of the citywide average of $222, according to NYC & Company. But existing hotels are just the tip of the iceberg for the neighborhood's hotel boom, experts say. Another two are under construction — the Fairfield Inn by Marriott (the second in the area) and the boutique Nesva Hotel on 29th Street, both of which are scheduled to open this summer. And two more are planned — the Toyoko Inn, a Japanese chain of no-frills business hotels, also plans to move into the area, bringing more than 600 rooms in a 35-story building, and CUNY wants to build a hotel to accommodate its visitors, according to the Long Island City Partnership, a neighborhood advocacy group. "On average our prices are 15 to 25 percent cheaper than Manhattan prices," said Jeffrey Reich-Hale, director of sales and marketing at Wyndham Garden Long Island City Manhattan View, a 128-room hotel that opened last month at 44-29 9th St., a block from the East River and three blocks from the subway. "That’s big savings if you’re staying for a couple of nights." Price is often the deciding factor, guests say. On Wednesday this week, a room with a king bed at the Fairfield Inn and Suites/Marriott in Long Island City cost $239 plus tax — a far cry from the $369 plus tax in Downtown Brooklyn and $549 plus tax for rooms in the chain's hotel on Fifth Avenue and 37th Street. With the relatively lower prices, the hotel business is booming in the neighborhood, with the average occupancy rate at 80-82 percent, above the citywide rate of 77.6 percent through March, said Reich-Hale, who is also a member of the Queens Tourism Council. "This week I’m almost sold out every day," he said. Hotels have been using slogans like "One block from subway, minutes from Manhattan," (Hotel Vetiver) underlining the proximity and easy access to the major New York City attractions. "You have eight subway lines that arrive in Queens Plaza and Jackson Vernon," said Gayle Baron, president of LIC Partnership. "It’s also a very safe neighborhood. Our international visitors like the fact that it’s a little hip and edgy." In addition to an array of subway stops, the neighborhood is packed with cultural institutions like MoMA PS1, Socrates Sculpture Park, the Noguchi Museum and the Museum of the Moving Image. "The neighborhood offers a wide range of cultural attractions, a thriving restaurant scene, and seamless public transportation to midtown and other parts of the city," said George Fertitta, CEO of NYC & Company. "More people want to visit New York City than ever before and they want to visit all of the city’s neighborhoods — Long Island City is at the top of that list." Tourists said they were drawn to the options that the neighborhood presents as well as the price of the accommodations. 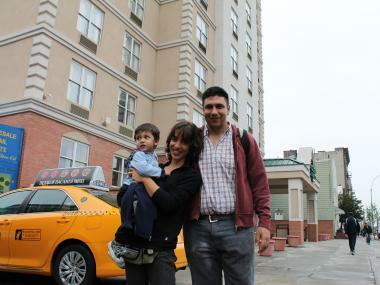 Jose Martinez arrived in New York from Argentina along with his wife and son. The family is staying at Country Inn & Suites on Crescent Street. "It’s just much cheaper than in Manhattan," said Jose Martinez from Argentina, who arrived in New York on Tuesday with his wife and son. The family was staying in the 133-room Country Inn & Suites on Crescent Street, which opened in 2009, where prices range from $140 to $170 a night. German couple Gabriella and Oliver Haag, who arrived in the city on Tuesday, were staying at the Holiday Inn on 29th Street. "We are paying $220 a night. That’s at least $100 cheaper than in Manhattan for the same standard," Oliver Haag said. "And we have a beautiful view of the Manhattan skyline," his wife added. Vincci Ng, 31, and KienNam Wong, 37, a couple from Singapore who are also staying at the Holiday Inn, said they were drawn to the neighborhood by the cultural institutions. But they said they were shocked by the rundown streets and buildings surrounding their hotel, located in the heart of gentrifying Dutch Kills. "We try to come back early, before it’s dark," Vincci Ng said. Sankar Tandum, who works at the front desk of the Country Inn & Suites, said it is packed with more than just tourists. "We are very busy," he said. "Lots of our customers are business people." As an increasing number of corporations, like JetBlue, choose Long Island City as their home, the hotels in the area are a convenient solution for corporate customers, industry workers said. The influx of guests is also a boon to businesses other than those in the hotel industry. "Business is better," said Alberto Rodriguez, 45, who works at LIC Deli & Grocery on the corner of 39 Avenue and 29 Street, just across the street from the Holiday Inn and a few doors down from Hotel Vetiver. "Tourists are coming to buy phone cards, soda and lots of water." "Hotels bring people into the community and so far it’s good, but I think we have enough for now," said Diane Walsh of the Dutch Kills Civic Association. "We don’t need more hotels."